Following Apple's acquisition of Texture, the company allegedly cut about 20 employees, likely due to redundancy with Apple's own services. This is reportedly part of a larger effort to bolster Apple News, with an integrated offering expecting to launch within the next year. Citing sources familiar with the matter, Bloomberg claims that, as Texture does now, a "slice of the subscription revenue" will go to magazine publishers that are included in the program. Tuesday's report by Mark Gurman at Bloomberg isn't exactly revelatory, and doesn't add anything more than is already known about the initiative other than the layoffs. Apple Senior Vice President of Internet Software and Services Eddy Cue spoke about the Texture acquisition at the SXSW "Media Curation, and Why it Matters" session, talking about how important curating news was to Apple, and how Texture would help Apple accomplish its goals — making it very clear what Apple had in mind. 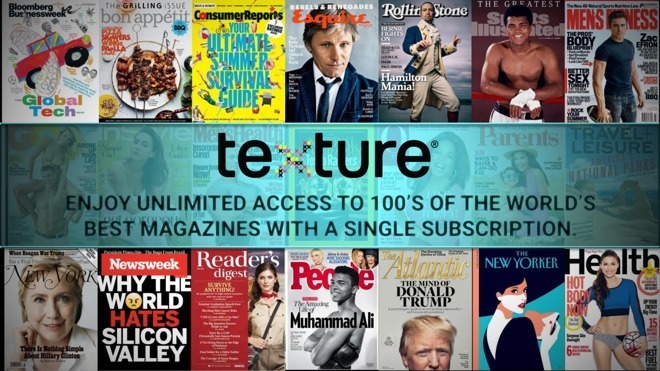 "We're excited Texture will join Apple, along with an impressive catalog of magazines from many of the world's leading publishers." Cue said in a statement about the buy. "We are committed to quality journalism from trusted sources and allowing magazines to keep producing beautifully designed and engaging stories for users." "We want the best articles," Cue said at the SXSW event regarding the company's plans for Texture. "We want them to look amazing and we want them to be from trusted sources." The terms of the deal are not known. Texture never disclosed its valuation.